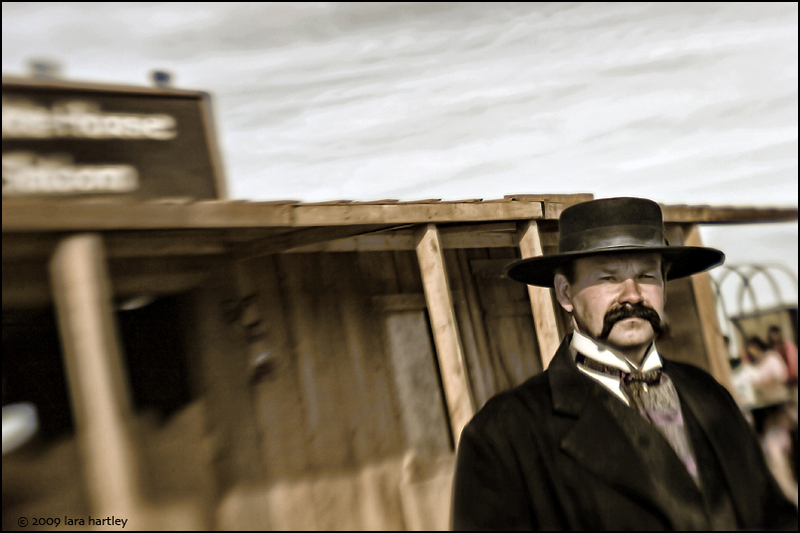 An actor portrays Wyatt Earp at a living history exhibition in Barstow. When the Earp boys, Wyatt, Virgil, and Morgan, cloaked in long black coats and accompanied by gambler “Doc” Holiday, made the famous walk to meet Ike Clanton and his gang in Tombstone, Ariz., Wyatt walked into an exalted place in the history of the American West. He still captures our imaginations, 81 years after his death. Wyatt Earp has fascinated me for years, inspired in part by Kevin Costner’s portrayal of the steely-eyed lawman. Who was the man behind the legend? I was especially intrigued after I read the book by Josie Earp, Wyatt’s last wife and companion, titled “I Married Wyatt Earp; The Memoirs of Josephine Sarah Earp.” It was an entertaining read, well edited by Glenn Boyer whose chapter notes and comments strengthen Josie’s narrative. E ven though no official marriage records have been found for Josephine Sara Marcus and Wyatt Earp— there is no doubt regarding Josie’s devotion to her man. Josie was an independent Jewish woman, ahead of her time. She ran away from home at 17 to join a traveling theater company. As fate would have it she met Wyatt a few years later and the rest is history. 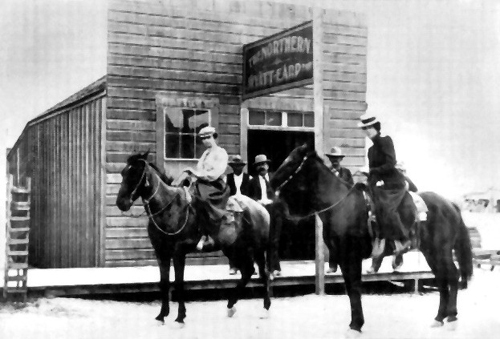 In 1897, Josie accompanied Wyatt to Alaska where they operated several saloons and gambling houses. They moved on to Tonopah, Nev., and opened the Northern Saloon. Occasionally, Wyatt also helped enforce the law in the Nevada town. Wyatt had a knack for finding precious minerals. In 1906, he and Josie put down stakes again, in the easternmost part of San Bernardino County where they prospected for gold and copper at the base of the Whipple Mountains until his death two decades later. As the story goes, after Wyatt died at the age of 80, Josie carried his ashes in an urn in her lap to Colma, Calif. to be buried in the Marcus family plot. Like all good stories, there are detractors that say that never happened and she was not that devoted to Wyatt. But something must have kept her around as she stayed with him for 47 years. Devotion works for me, and it appears to have been returned in full by Wyatt. Despite his coldness and downright disdain for his second (common law) wife, Mattie, Wyatt seemed to be completely devoted to Josie — who he fondly called by the nickname Sadie. I read Josie’s book before I came west to Barstow in 1997. 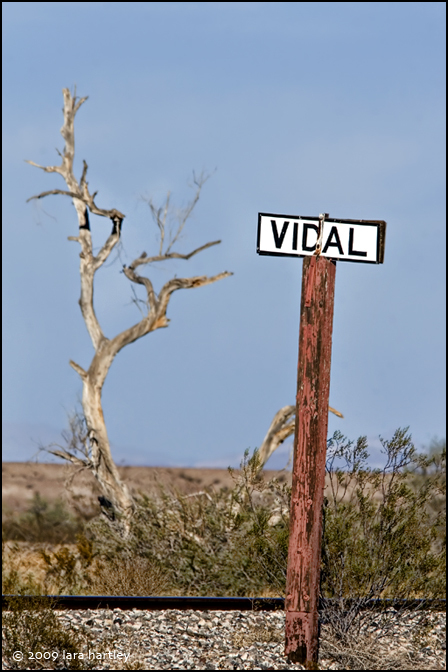 As I was plotting my route, I discovered Vidal, Calif. — where one of the Earps’ houses was located. It was on the way, and I wanted to see that house. Being in places where historical folks have lived normal lives makes them seem more real. Connected. Not just words on a page or a computer screen. Well, I didn’t have the foggiest idea where the Earp house was located, nor what it looked like. Hard to find something when you don’t have a clue as to its appearance. 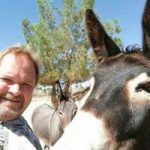 In October 2009, just four days shy of the Tombstone gunfight anniversary, I got the bug to go wandering east, a bee in my bonnet you might say. I was going to find Earp — the town named after Wyatt and maybe, if I was lucky, his house in Vidal. I should have done more research before I left town. But it was a beautiful day and I wanted to hit the road.I figured somebody out there could point me to the Earp house in Vidal. I headed east on a sunny Sunday afternoon and I was amazed at how verdant the Mojave Desert was in the Fenner Valley. There must have been some substantial rain to green-up the desert like that. As I drove south on Highway 95 I could see ocotillos in full bloom with fresh green leaves. The normal blooming period is March to July. The desert is always full of surprises. On a map, Highway 95 looks as if it is the middle of nowhere and indeed, there aren’t many towns between Needles and Blythe. But the road is busy. Lots of semi tractor-trailers, RVs and road-warriors heading to and from the Colorado River for fun and recreation. Vidal Junction is at the meeting point of Highways 62 and 95. There isn’t much there. A few houses and the agriculture inspection station for cars entering California from Arizona. Oh, and the defunct Vidal Junction Cafe with a chicken on its roof and antique wagons and such around the building. I wonder, is placing big farm animals on building roofs an American thing? Or do other countries have chickens and horses and cows (oh my) on the roofs of their buildings? The restaurant has been closed for about a year — the owners retired — and it is for sale. 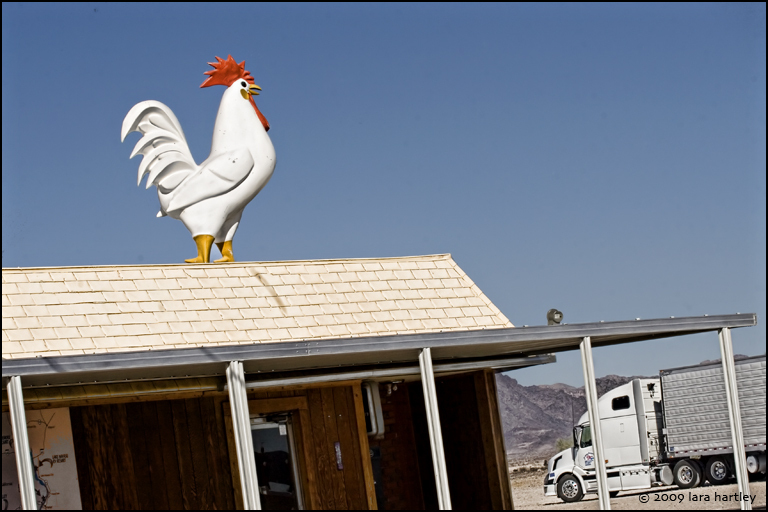 A semi-truck sits parked on Highway 95 near the Vidal Junction Cafe, complete with a chicken on its roof. 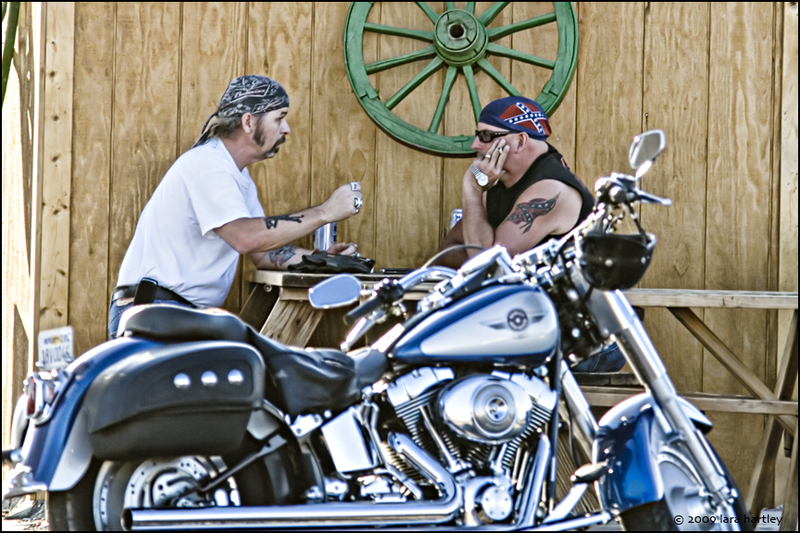 There is a mini-mart at the junction and gas for folks low on fuel, much to the relief of the Harley bikers. For fans of the roof-animals roadside phenomena, the mini-mart has buffalo. I am not really sure how relevant those are to the area, but, well, there they are. I drove six miles south of the junction to Vidal the town — still clueless as to what I was looking for. Maybe I was hoping for a divine sign pointing out the house. 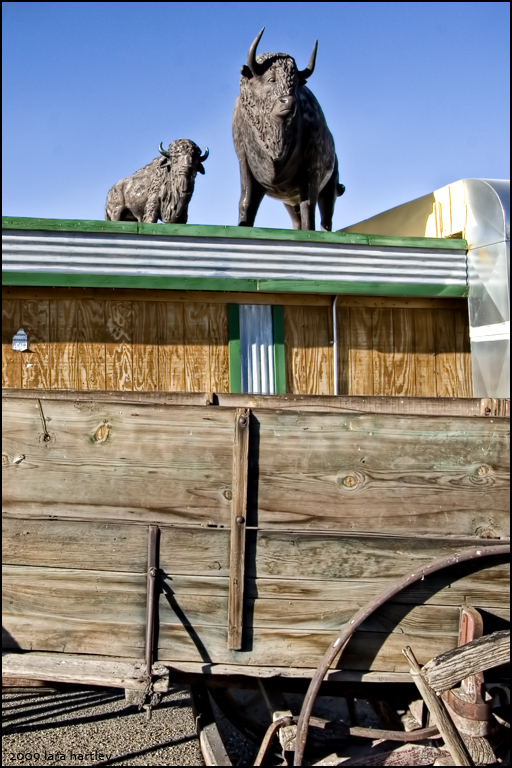 A pair of buffalo greet visitors to the Vidal Junction mini-mart. No such luck. I drove around a little bit, photographed some run-down places including one old gas station. Nothing jumped out at me as being the Earp residence. I made a little visit to the cemetery, paid my respects to the dead and went back to Vidal Junction. I thought surely, the woman at the mini-mart would know where the house was located. She informed me Wyatt’s house wasn’t in Vidal, but down the road in Earp, next to the post office. She said nothing was left except for a concrete foundation. Well, that didn’t sound too photogenic, but since I was going that way anyway, and then on to Parker, Ariz. for dinner, I would check it out. Things were certainly not going as I had hoped. Spontaneous road trips hardly ever do, I suppose. Besides, doesn’t everyone always say, “It is the journey, not the destination that is important?” Hmmmmmm, maybe. This abandoned gas station is decorated with a variety of names and what appears to be a punk version of Wyatt Earp. Sure enough, there was the concrete pad next to the Earp, Calif. post office, Zip Code 92242. There were also wooden grave markers commemorating Wyatt Earp and gunslingers Curly Bill Brosius and One-Eyed Jack Faro — men Wyatt is supposed to have killed. History doesn’t always get the details right and really, who knows the whole truth, but the stories are interesting. Being a Old West buff, I love reading all the old tales. I photographed the details around the post office and the grave markers; the light was going and there was no house to photograph, so now what? My original plan was to have dinner in Parker, stay the night and head home the next day. I did have dinner, a great one by the way, at El Sarape Restaurant. Shrimp tacos — GRILLED shrimp, not battered and fried — homemade chips and salsa and guacamole — I was a happy girl. Who would have thought this desert diner would have such good food? But after dinner I figured, why spend $$ on a motel room, when I am only three hours from Barstow. 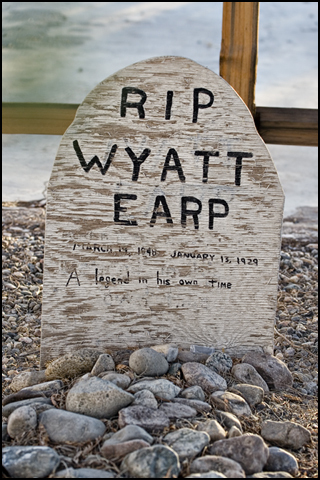 Tombstone hosts an annual Wyatt Earp Days festival. A different scenario: What Hollywood never told you, this is what really happened! by A fourth generation cousin of the Clantons involved in this famous confrontation https://www.clantongang.com/oldwest/gunfight.html by Terry Ike Clanton. This is an interesting start on what could be a great story. I’m looking forward to part two. Many thanks to people like Lara who take the time to reseach the past, so others like myself can enjoy it. Interesting, nicely written. I look forward to the next part. I could have a couple of those tacos and part two of this story. I was totally absorbed with story line and description of land marks wanting to keep reading more. Thank you so much for this article. I will be watching for next part. You might be interested in a video of a mine that a friend purchased the mining rights to. Its a claim that supposedly was owned at one time by Wyatt Erap. Its east of Vidal Junction. I can’t remember how far. There really isn’t much in the video but my friend is a old west fan and is a fan of Earp. You can see him trying to be funny in the video turtle shell. I moved to Yucca Valley as a teen in 1976 and some of our first road trips were to the Colorado River down highway 62. In the late 70’s on the way to the “River” we would pass a sign that said “Wyatt Earp’s House” with a big arrow pointing to a small wooden shack that he reportedly called home. It was very small and in disrepair. A few years later the roof was sitting on the ground, the house/shack had fallen down during a wind storm. During subsequent visits it had slowly disappeared. I always wondered if this really was Wyatt’s winter home and base camp for the mining that he did in this area in the winter time. I love this article and can’t wait for part two. From all us “armchair historians” out there,Kudos to you! !A great part one…but enough with the tease,when do we see part two? !…many thanks!! Nice story, Only thing I found out I didnt like was the fact I wasnt there enjoying the discovery and trip!!!! Good story and this is the stuff I look forward to do and enjoy! My problem is I need a partner to enjoy the discovery with! Thanks for sharing your trip. It was like being there when I’m 2500 miles away. It’s amazing how this story can still occupy present day time the way it does. Visiting the actual places of the events has got to be exciting at the least. I can’t wait for part two! The town of Monmouth, Illinois brags about being the hometown of Wyatt Earp and there is a series of impressive murals painted on some public buildings in the downtown. The house itself is rather plain, but with a front porch. It is surrounded by a very high fence and I understand that there is a gunfight show put on regularly on that street, or in the backyard during the summers. I think I know why he left Illinois for Arizona, because so did I. Great article! My bf and I will be going to Tucson, with a side trip to Tombstone, in March. The timing of this article is perfect! Very nice. I like My Darling Clementine better as an Earp movie, but the Costner film will do. I just like Ford directed movies. Your writing is quite good, and the history makes me want to read that book. I suggest reading Frank Waters; “The Earp Brothers of Tombstone” based on his interviews of Virgil Earp’s wife. the describes thier card cheating, staged stage robberies with the compacancy of the local station operator, Doc Holidays drunken shooting of thier own partner,etc. Hardly the stuff of heros but more like the real americans they were. Hope people saw the program on PBS about Earp on 1-25-10. Sort of destroyed some of the myths that have sprung up around the man. Read this story with humor. 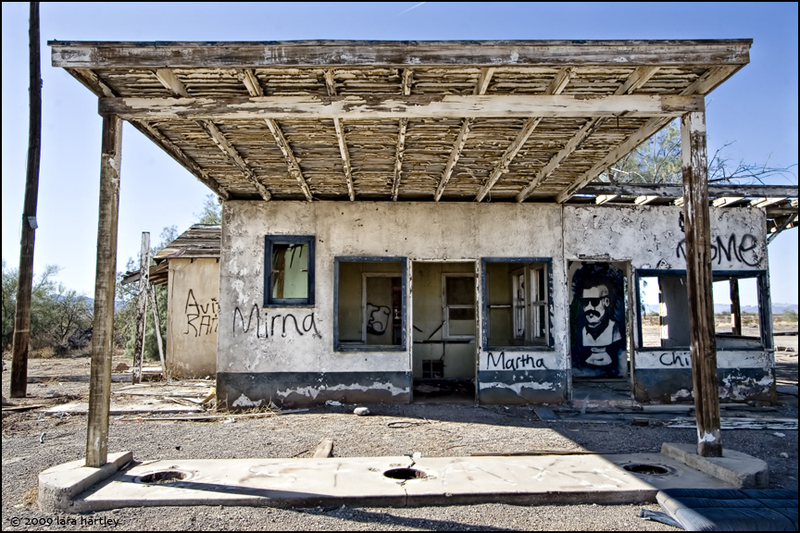 Little did she know on the quest to find Earp’s hosue it was just to the left of the old abandoned gas station. I live in Parker and visited the site many times. The old concrete building is not Earp’s house, it’s a structure for a repair shop that never opened years ago. Earp’s shack from his mines near the Whipple mountains once stood near the Post Office but burned down years ago. The folks from Earp, CA. move the shack there in honor of Wyatt Earp. I remember my father taking me to the small shack as a little boy. my near retirement, and your article whets my appetite for that. Can’t wait for part 2 ! Very entertaining! I spent some time living in parker, in government housing on the reservation . i remember how the Earp house looked before it fell apart. it had a flag pole that ended up down the street from my house. windows went to other houses. people were taking whatever they could get from that place. This made me sad . I thought at one time it had been taken care of by either the State or county parks department. when they stopped people just helped themselves. I know where Wyatt Earps house is. its all over the reservation in pieces.